Brooke Blessington, a University of Nebraska–Lincoln graduate student in the Department of Agronomy and Horticulture distance program, was selected to attend the 2018 U.S. Borlaug Summer Institute on Global Food Security, June 3-16 at Purdue University in West Lafayette, Indiana. Blessington is specializing in plant breeding and genetics and is advised by Don Lee, professor of agronomy and horticulture. The annual two-week long, learning program for graduate students, funded by the U.S. Government’s Feed the Future Initiative, centers on developing participant understanding of the challenges surrounding global food security. It provides a working knowledge of these issues, with a focus on cross-disciplinary problem solving of real-world development challenges. Mary Happ, a Nebraska agronomy doctoral student specializing in plant breeding and genetics, also attended the Borlaug Summer Institute. Blessington is the Executive Director of Madison County for Iowa State University Extension and Outreach. Prior to accepting her position with ISU, she worked over seven years for DuPont-Pioneer in Johnston, Iowa, in crop genetics research and development, working on molecular cloning for agronomic traits in support of soybean yield enhancement, corn drought tolerance and nitrogen use efficiency initiatives. During the summer institute program, participants heard from numerous director generals of international organizations, agency leaders and scientists from a variety of fields of study and from a cohort of 39 other graduate students selected for the institute and interested in working toward global food security. They worked on team projects based on implementing interventions to increase food security in Feed the Future focus countries. Blessington’s team focused on Guatemala and the agencies established there. “Because of the Borlaug Summer Institute, my professional network has grown. I learned new information and I’m challenging myself to work with a cross-disciplinary mindset. This has set me up for great personal growth,” she said. Blessington noted that working with experts in other fields made her more aware of the opportunities for involvement and the challenges to creating sustainable change in a food system. She feels education and technology transfer play a huge role in a global food system. She wants to apply her technical knowledge to improve agricultural systems in a sustainable manner and use her role in extension to work in a cross-disciplinary manner to carry out the land-grant mission and improve the quality of life for those served. “The Borlaug Summer Institute was a great way for me to envision a way to make my life useful and turn the world over to my son’s generation, better than we found it,” she said. 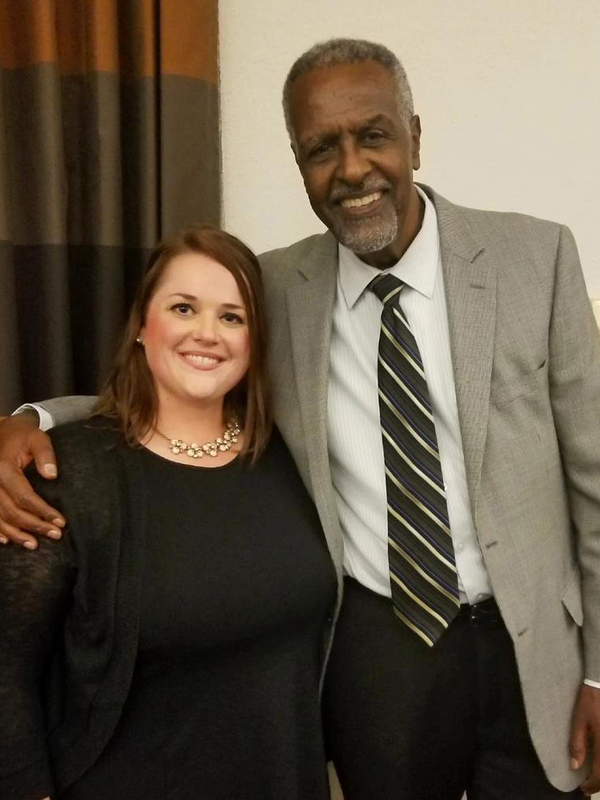 Brooke Blessington with Dr. Gebisa Ejeta, 2009 World Food Prize Laureate, at the 2018 U.S. Borlaug Summer Institute on Global Food Security.